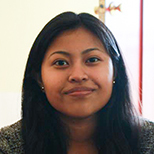 Idalmis Vaquero is a senior at Wellesley College majoring in environmental studies. Passionate about environmental justice in her community, she has interned at Communities for a Better Environment in Los Angeles and intends to pursue a law degree to advocate for low-income communities of color. She was recently awarded the Morris K. and Stewart L. Udall Scholarship for environmental leadership.